Relive the adventures of Ban Mido and Ginji Amano as they “get back” the things people lost! Sentai Filmworks is a North American anime company that releases licensed Blu-Ray and DVD copies of great anime titles. It was announced on their official website on February 1, 2012 that they have gained the license of the famous anime that was produced by Studio DEEN and that they would be releasing the series in digital formats sometime this year. With Ban’s “Evil Eye” ability which creates illusions in his victims mind and Ginji’s talent for harnessing the power of electricity, the GetBackers can get anything back for you, just name it. Whether it’s a top secret project, a person, a stuffed animal or even hope that is lost, the GetBackers can literally return it back to you. 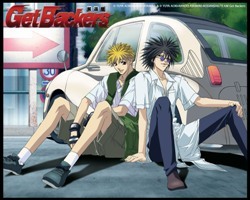 The GetBackers has a total of 49 episodes and is designed by Nakajima Atsuko who also designed the anime films “You’re Under Arrest” and “Ah! My Goddess”. And knowing that this is produced by Studio DEEN is another plus; Studio DEEN is one anime producing company responsible for unforgettable titles such as Rurouni Kenshin, Fate Stay/Night and Rave Master. So if you hired Ban and Ginji to find something you lost, what would that be? I believe that get backers should be continued cuz I know that the fans want more of Ban and Ginji and I believe that their fight with the gods of limitless fortress is not over. We still haven’t seen Ban and Dr. Jackels True power.